Helping you build the business of the future. Using data as a competitive advantage. Our belief is that data is insight and insight is human. This is why each of our services has been designed by people for people. We are often praised for building extremely close relationships with each of the people we work with, which in turn translates into a higher motivation to drive change and greater ROIs. Change can be as exciting for some people as it can be scary for others: we know how to talk differently to people with different vested interests in order to bring them all around our ultimate mission: building together a future-relevant data-driven business. 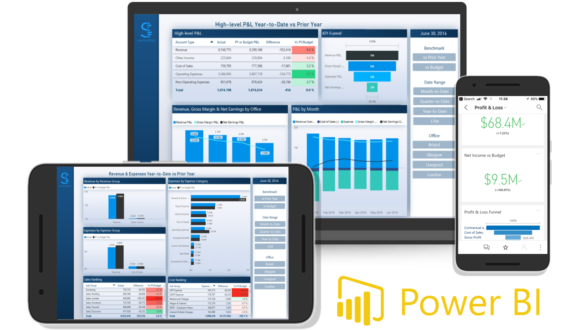 Dashboards and reports are the eyes of businesses. 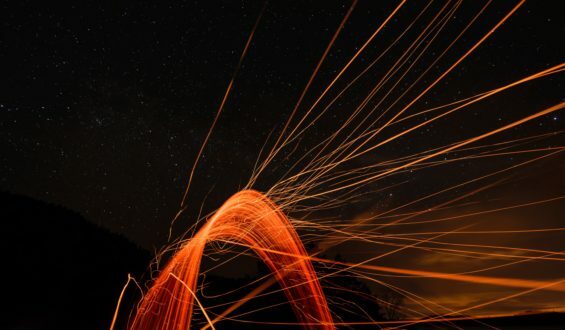 When built effectively, they provide the ``holy grail`` of management: a total control over business operations and a highlight of critical areas at all times. Once KPIs and corresponding dimensions have been set, we use our extensive data storytelling experience and proprietary framework to deliver highly intuitive and insightful data stories that exceed expectations, every time. Would you like to get a custom dashboard ? You are ready to take your business to the next level. The problem is you are held back by processes that are manual and time consuming. You can't find any off-the-shelf apps or services to solve your team's specifics challenges, and you lack the developers budget a custom app built from scratch. 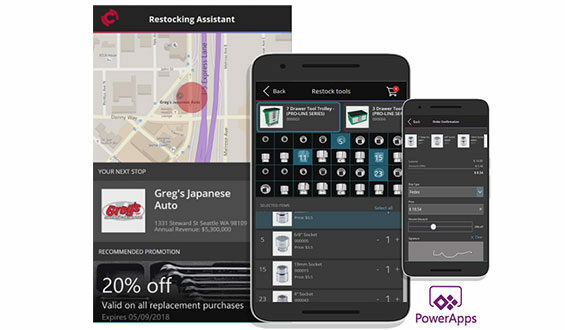 With Microsoft PowerApps, we help you digitize and automate business processes by turning your business expertise into custom applications. Business apps are the organs of your business: they collect raw information and send it to the business brain. It's time to boost your team's productivity with a custom app that's exactly the right fit for your business. 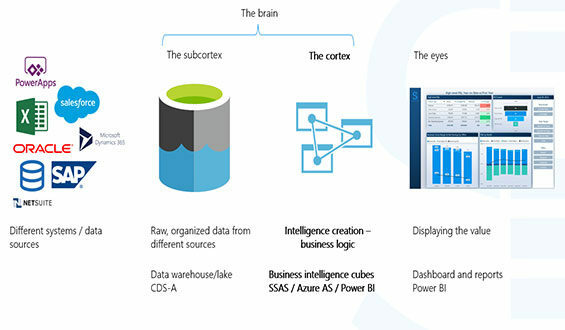 Data cubes constitute the cortex of your business' brain. It’s where the magic happens, and where your unique business logic is built. We build and customise data cubes that enable people to slice and dice data like never before, using the self-service Reporting and BI tool of their choice. Our solutions are flexible and evolve with business needs. 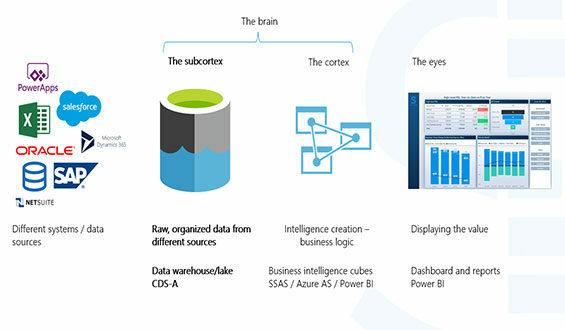 The data lake / warehouse is the subcortex of you business' brain. It gathers raw information from different sources and centralizes that data in one place, called single source of truth. A central data repository becomes necessary when you want to analyse data from multiple sources such as ERP, CRM, Files, SaaS services, ... together. When investing in a data lake / warehouse, you are future proofing by investing in a historical and coherent picture of your business at a point in time. Deploying analytics in a company is like building a house. Without a plan, you start building walls that eventually won’t join together to form your harmonious home. If you do not plan ahead a bit, chances are that soon you’ll have to demolish the structure in place and build everything from the ground up. Similarly, no dashboard should be deployed without knowing exactly where it fits in the “big picture”. We help you build a bespoke roadmap: a step-by-step plan to reach the analytics edge and gain a competitive advantage with data. User adoption is the ultimate measure of success analytics project and the Human is well known to be reluctant to change. 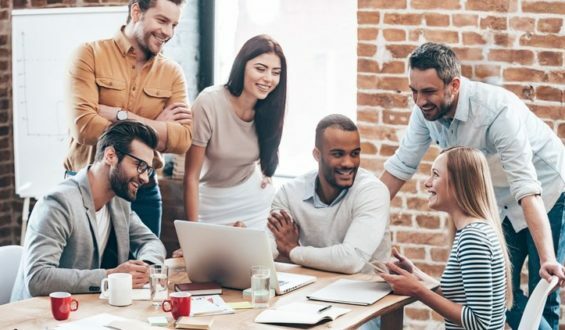 That is why we put a strong emphasis on user adoption with a range of services that enable change: Power BI certifications, Users Reinforcement trainings, User usage monitoring (analytics on the analytics), incentives implementation for managers, and more to help you build a data-driven culture. Making a modern MI team with the right balance of data and business skills more affordable for SMEs. We know that modern analytics solutions change your business, your culture and your ability to take advantage of unknowns. The challenge for businesses is in being able to identify, recruit and retain a new kind of profile: people with quality data skills together with a strong business mindset that can deliver the promised benefits of your data analytics projects. Demand is high, supply is low, increasing the risk for in-house undertakings. Our Analytics as a Service offer tackles this problem head on. Need an affordable MI team? Advanced modelling and analysis for a serious business advantage, because reporting history isn’t enough. Once your core reporting is in place, we help you transform into a forward looking organization. We offer ad-hoc support via phone, email, and video conference. Big problems, quick questions, or mysteries solved: we'll keep you rolling.